Plant these seeds and colorful striped leaves will soon come, just be sure to sow when the soil has warmed. The perfect backdrop to other grains such as amaranth and quinoa, it also can be restrained by growing in a container, where it will mix well with vigorous annuals such as Sweet potato vine. Depth: 1/4"; sow in blocks of at least 4 rows for prime pollination, which produces higher-quality ears of corn. Starting Outdoors: Direct sow after soil temperature has warmed to at least 60°F. Sow after frost in blocks of at least 4 rows for prime pollination, which produces higher quality ears of corn. 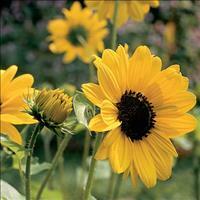 Or, grow in a container for smaller plants—makes a great centerpiece. 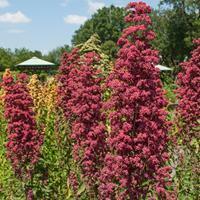 Does best in regular, well-drained soil in full sun. Corn does not like to be disturbed once planted. Fertilizer: Scratch in a few inches of compost before planting. Diseases & Pests: Avoid fungal issues by spacing properly and placing in a location with good air circulation. 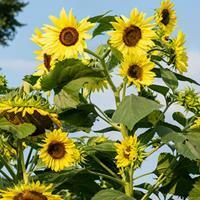 If problems arise, treat with an organic fungicide or neem oil. Corn borers can be troublesome in areas where corn is grown frequently. Beneficial insects will consume the majority of the eggs, but if necessary, an application of spinosad will do the trick. If flea beetles or cutworms are not kept under control by beneficial insects, treat with an insecticidal soap. 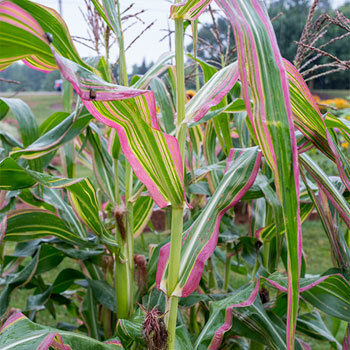 Plant: Corn stalks with variegated leaves of green, pink, white, and yellow. When to Cut: Once the ear has dried on the stalk; solid kernels keep best. Test by pressing a thumbnail into a kernel. If it is hard, harvest the ear. Corn is a member of the grass family, Poaceae.